GeneRally Game Review - Download and Play Free Version! Wide array of maps to choose from as well as creating your own. Controlling your car with the arrow keys makes it easy and fun to operate. Up to 5 Artificial Intelligence (AI) racers which can have their skill level adjusted. Option of multiplayer racing on the same computer only. Multiple players must share the same keyboard. Setup is confusing at first if you don't read the readme file. GeneRally is a racing game for one to six players. You'll be racing on various tracks in time trial mode or against human and/or computer opponents in championship mode. The game has a similar feel to the arcade classic, Championship Sprint, minus the cool powerups you can grab on the track. However, you can choose your type of car from rally car, turbo, go-kart, and even a one wheeler. Once you create a couple of computer opponents, race until your heart is content. You can set the number of laps up to 100 so there will never be a shortage of gameplay. 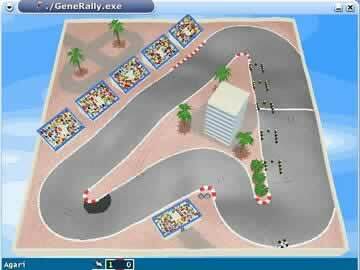 GeneRally is a classic style racing game reminiscent of arcade classics such as 4X4 Off Road or Super Sprint. GeneRally improves on these classics by adding several customization options. Customizing racers is easy to do and allows for a more varied racing experience. For your racer you can select the colors of the car on a standard RGB slider and the color of your helmet. The other customizable option for human players is controls, the default is the arrow keys but if you're going to do multiplayer you can set a second racer to the WASD keys or any configuration that works for you. For all racers you can select the model of your racer and it doesn't affect the speed and control of the car so go ahead and race indy cars with monster trucks. The AI racers offer the same color adjustments and a skill level adjustment which ranges from beginner to impossibly good and you can have as many as five AI racers on the track with you. GeneRally has many customization options but did not include any way to upgrade the performance of the racer such as acceleration, tires or handling modifications. Leaving these options out makes this a simpler game but you lose the excitement of upgrading your racer's performance. GeneRally offers a wide variety of tracks to race on as well as the option to create your own tracks in the editor included in the download. The editor is fairly simple, working a lot like a paint program. It has all the objects you'll need pre-programmed in to make track creation as easy as possible. You start with a blank canvas so track creation is only limited by your imagination. Starting out, the controls can seem a little difficult if you're not used to this control style as the overhead view can cause confusion as to which way to turn but if you run a few laps you will get the hang of it pretty fast. 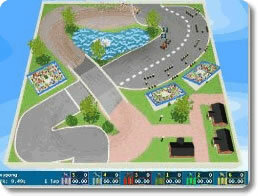 The racing surface varies by track and can increase the difficulty of controlling your racer. When playing solo the game gives you a ghost car that runs at the same speed and path of your best lap so you can continuously try and beat your best time and improve your skill. Another addition to this game over others is the pit crews, they can repair the damage done to your racer from hitting the wall or the tire wear from racing. To receive repairs all you do is simply pull in and stop long enough to perform the repairs. Setting up the races and seasons is simple you just select the number of laps for each race. The next step is to choose the tracks you want in your circuit then you're ready to race. The graphics and sound are similar to what would be found on an original Nintendo but it doesn't detract from the game at all. 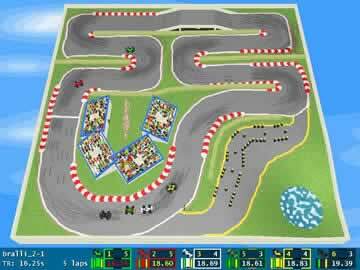 The only problem I encountered with the graphics is when objects are colored similarly to the track or the direction of the track is unclear without following the AI racers. Also the pit crews can easily be mistaken for barrels at first if you don't know they are there. The trees, ponds, cement walls and other obstacles make the courses challenging and visually appealing for the player. GeneRally does a fantastic job of combining the simplistic play style of an arcade game with the customization options of a more advanced racing game. With all the different difficulties, tracks and the ability to make your own tracks and play with friends this game will provide unlimited hours of entertainment and enjoyment. Check out a few tracks and racing action in this clip of Generally.